Let me start by saying, I’m not artistically inclined… at all. I’m a former high school math teacher. So this “journey into the unknown” really took me out of my comfort zone. I’ve been to a few art museums, but had you asked me in 2013, as I was standing in front of Monet’s Water Lilies at Nelson-Atkins in Kansas City, if I thought I’d ever curate an art exhibit, I would have straight-up laughed in your face. But this semester, my students and I did just that. And in the process, we learned more about rural education than we ever could have by staying in a college classroom. It all started when I met Melissa Proietti at Teachers College Columbia in October 2016 at the 2nd conference on anthropology and education. This was recently after I had moved to the North Country and started my job here at St. Lawrence University. Inspired by her presentation, and knowing that Montreal is a short drive from Canton, I approached her after her presentation to introduce myself and to suggest that we stay in contact to potentially collaborate someday. She reached out via email shortly thereafter. I had mentioned to her that I would be teaching a class on urban education in spring 2018, and we agreed to brainstorm ideas for how I might integrate an arts-based component for the course. Almost a year after we first met, the call for proposals came out for funding under the SLU Arts Collaborative. I forwarded it on to Melissa, and from there, we began developing the project that would become What’s Pressuring You? Growing Up in the Modern World. What drew me to Melissa’s work was how open and honest it allowed students to be. She works with students at James Lyng High School in Montreal, and through the student-driven creation of the Up Next Gallery, students have commandeered a school space to voice their thoughts on the importance of Black history, local heroes from their neighborhood, and the need for a skate park, among other topics. The urban education class I originally envisioned morphed into a class comparing urban and rural education (EDUC 3031). Upon receiving funding from the Arts Collaborative, the class took on an arts-based, assets-focused lens to counter the often deficit-driven perspective the media and public perception holds of schools in urban and rural educational environments. While there are many differences between the two ends of the urban-rural “spectrum,” what gets lost in this dichotomous way of thinking about various contexts is that they also have many similarities. For example, both urban and rural schools run the risk of having to close their doors. In the case of urban schools, this often occurs when charter schools siphon students from traditional public schools through the neoliberal guise of “school choice”; in rural areas, school consolidation may force schools to combine their student populations into one school when enrollments dwindle due to economic decline. Taking these similarities into consideration, Melissa and I wondered, could an urban arts approach work in a rural community school? We decided to find out firsthand. A month later, in November 2017, I met with Shaili Singh, Greg Kiah, and Michelle Rodee at Canton Central School to discuss a potential community-based arts partnership between their students and mine, which would culminate with an art exhibit curated by SLU students, showcasing art created by Canton Central students. After a successful meeting, Mr. Singh, the dean of students at Canton Central, started to look for a space for the exhibit. After trying to gain access to several vacant properties, including the old McDonald’s building, we ended up contacting TAUNY (Traditional Arts in Upstate New York), who were gracious enough to agree to let us use their classroom space upstairs. Once spring semester started and the EDUC 3031 students came up with a theme (pressure), Mr. Kiah had his students brainstorm topics for their art. As you can see, their brainstorming was quite productive. Discussing the resulting concept maps in class with my EDUC 3031 students, there was a sense that these pressures were both relatable (after all, we were all once adolescents), but also surprising. While we all nodded our heads to the pressures of college, homework, and body issues, we were taken aback by those pressures that sometimes go unsaid, like poverty, mental illness, politics, and identity issues. For the following two months, students from EDUC 3031 visited Mr. Kiah’s first and third period studio art classes and interacted with ninth grade students as they worked on their art projects. Thanks to the generosity of the Flint Fine Arts Endowment, I was able to provide supplies like sheets of plywood, a mannequin, and primer. During our EDUC 3031 class time, students would recap their conversations and interactions with the Canton Central students, telling stories of conversations about what college is really like, dealing with cliques, and other issues. During the week of April 9, the students from EDUC 3031 and I, along with Melissa Proietti and Sterling Downey (the founder of the Under Pressure graffiti festival that takes place in Montreal every August) began to prepare for the final curation of the exhibit space. During our Monday class, we met at Canton Central School to see the (nearly) finished art pieces. These pieces spanned the topics of suicide, body image, toxic masculinity, depression, the opioid epidemic, social media, academic achievement, sports injuries, and fear of nuclear war, among others. I was absolutely astounded by the level of complexity and critical thought exhibited by this art. The pieces were diverse in subject, as well as in material and aesthetics. During Wednesday’s class we visited in the TAUNY space and began to creatively think through how best to use the space while remaining true to the meaning behind each and every piece and the exhibit as a whole. One might think that everything was falling into place at this point, but while away at a conference in New York City that weekend, I began to receive emails highlighting potential problems we had not yet considered. I was notified that the advertised 3:00-6:00 opening reception would likely not allow for students and their parents to attend (completely antithetical with our aim to empower our student artists). People were worried that the space would not be sufficient to show all of the pieces; after all, we had not expected the quantity or size of the twenty large-scale art pieces the students (64 Canton Central students participated) had created (a reminder to always dream big, lest your wildest dreams come true). There were worries of potential censorship, as some of the pieces (namely, a large painting of Donald Trump’s head) were very political, and might be construed as controversial. As such, I began to look for a new location while sitting in the middle of Central Park. Enter Charles Rouse, local bed and breakfast owner, who also owns the old Gamer Craze shop in Canton. Sight unseen, we reserved the space with him and I prepared to go in blind on Monday morning with students to start our curation brainstorming process anew. After a late night of delayed flights, I arrived back in Canton and met a few students who had volunteered to come to class early. We had been warned that the space would need to be cleaned up and we set to work, moving wood with nails sticking out of it (my maternal side coming out, making sure everyone was up to date on their tetanus shots) before busting out the Clorox wipes. As the rest of the class arrived, we began to make trips to Canton Central School to begin transporting the art to the exhibit space. As the art began to arrive, Sterling taught students how to prepare the art with wire and install it with picture hangers. Clorox wipes, power tools, hammers, and wire cutters… who would have thought those would be necessary school supplies for a college education class? By the end of the afternoon, all the art was hung and the spotlights focused. I would complete the finishing touches, hanging the name plates and artist statements the following morning, and anxiously await the start of our 3:00 opening reception. 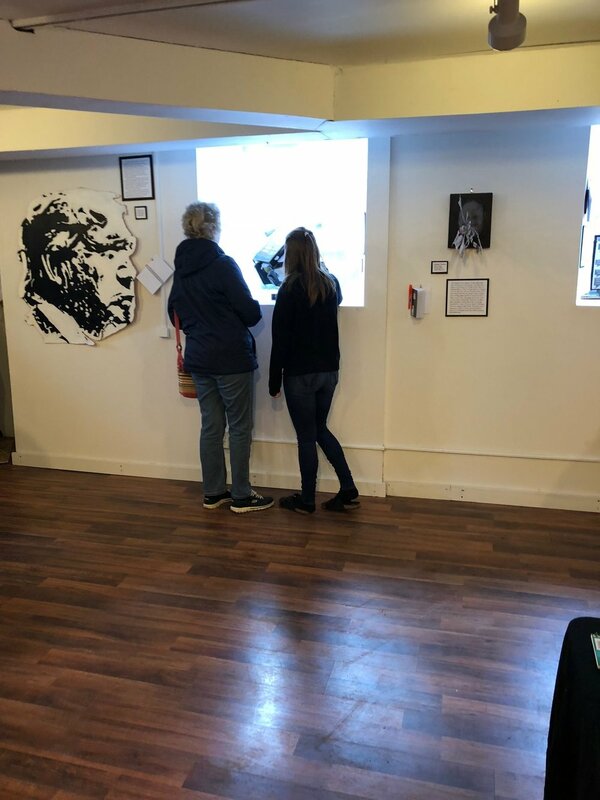 Between the six-hour reception and the other three afternoons/evenings we had the exhibit open (staffed by EDUC 3031 students for a total of 18 hours), over 100 visitors came through to view the art. These visitors included local teachers, the student artists, parents, university faculty and staff, and other community members. Overwhelmingly, the response was one of awe at the amazing depth of feeling and critical thinking embodied by the youth-created art. My main takeaway from this experience was a reaffirmation that if you give youth space and trust, great things will happen. 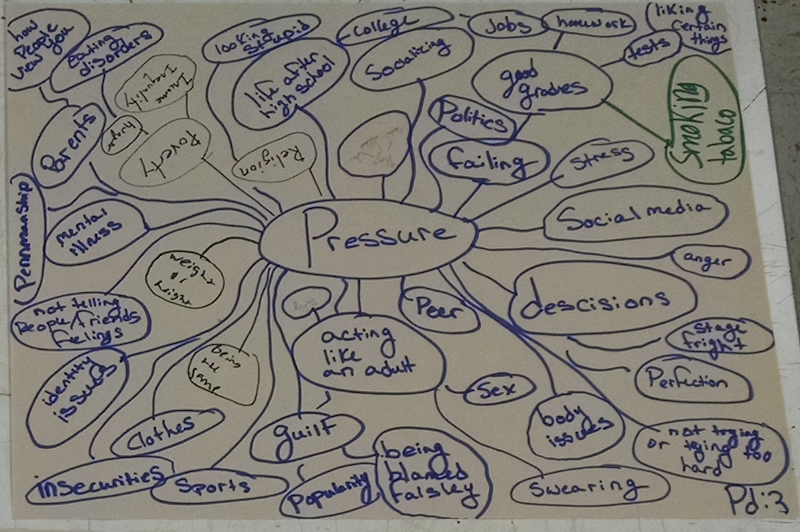 Too often, we don’t think that youth have the capacity to understand the complexity of the pressures they’re experiencing. We brush them off and say that they’ll understand when they’re older. But what if it’s us, the adults, who truly don’t “get it”? Who better to talk about the pressure and fear associated with school shootings than the youth who enter the school building every morning? Who knows more about what youth need when coping with a classmate’s suicide than the youth coping with a classmate’s suicide? In participating in this process, my students and I observed youth who were yearning for an outlet, wanting to talk about subjects adults typically encourage them to brush under the rug. Not only did the art inform teachers and parents about what their students were dealing with, but it also allowed students to see that their own struggles were shared by their peers. In the end, this was a less than perfect first attempt, but it won’t be the last. I’m still in awe of what we accomplished. I’m so proud of the Canton Central students for being so raw and honest with their art, my students for being so dedicated to what I’m sure seemed like an unconventional (at best) idea on day one of the semester, and the community partners for being open to this project and giving of their time, space, and energy. In all its imperfections, the outcome was extremely powerful, and I truly believe all involved parties walked away with a new perspective.